Microsoft Excel and other programs in Microsoft Office provide a handy feature called “Quick Styles” to help you quickly format a selected range as a striped table. The table can have zebra lines meaning alternating rows are formatted with different colors (see example). Google Sheets do not support zebra stripes (yet) but you can use conditional formatting combined with a simple Google Formula to create a formatted table. 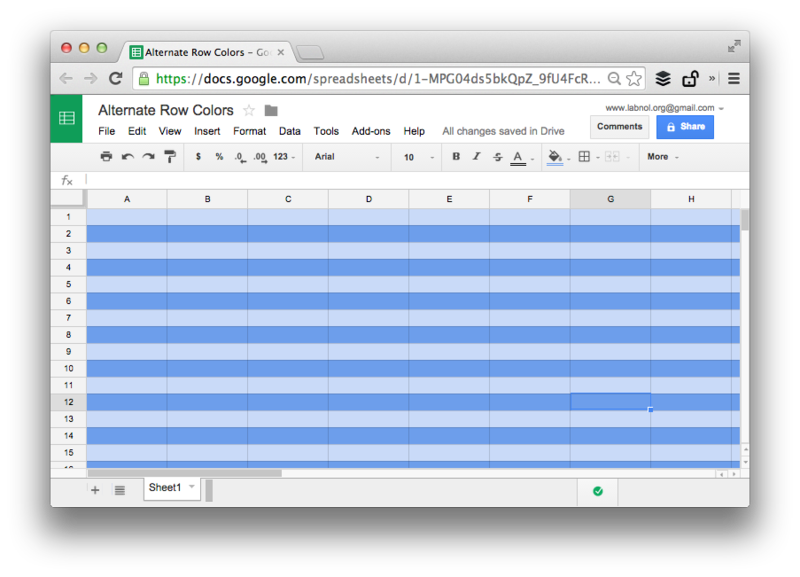 You can apply alternating colors to both rows and columns in Google Sheets easily. Open a Google Sheet and choose Conditional formatting from the Format menu. Select Custom Formula from the dropdown and put this formula in the input box. Select a Background color for the rule and set the range in A1 notation. For instance, if you wish to apply alternating colors to rows 1 to 100 for columns A to Z, set the range as A1:Z100. Click the “Add another rule” link and repeat the steps but set =ISODD(ROW()) as the custom formula and choose a different background color. Save the rules and the zebra stripes would be automatically applied to the specified range of cells. Tip: If you wish to extend this technique to format columns with different colors, use the =ISEVEN(COLUMN()) formula. Simple!